The English are world famous for their love of gardening. Perhaps less obvious is the horticultural enthusiasm of the Edo period Japanese, who were just as keen a gardener as the English. In fact, Japanese Edo period eras are often twinned with certain flowers and plants that became particularly fashionable during the period. For instance, camellia is associated with Kan’ei era, while azalea marked the Genroku era. 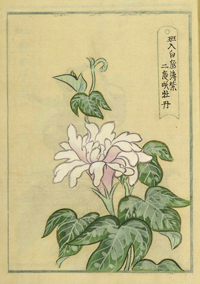 Other examples include chrysanthemum of Seitoku, acer tree of Kyōhō, Ardisia crispa of Kansei, morning glory of Bunka-Bunsei, Japanese rhodea and pink of Tempō, and henka or ‘mutant’ morning glory of Kaei-Ansei eras. Such associations reflect the gardening fever experienced in many parts of Japan centered on Kyoto, Osaka and Edo during the 17th to 19th centuries. And it is thanks to books and other printed documents from the periods that help us understand the extent of this vernacular enthusiasm. Amongst the surviving number of books on popular flowers, those concerning morning glories are particularly copious. Particularly noticeable are those depicting henkaor ‘mutant’ morning glories. Morning glories were originally introduced to Japan as a medicinal plant, laxative to be precise, some 1200 years ago. Their effective yet ephemeral blossoms, however, made the annual plant a popular ornamental container foliage. Their rise to stardom comes in late Edo period when morning glories suddenly experienced a mutation. The new generally non-seed-bearing mutant strands produced a range of spectacular and some most peculiar flowers (and indeed even curious vines and leaves). To capture the cacophony of strange mutant morning glories, records were made in copious amount compared to other botanical records by enthusiasts with many containing illustrations. The origin of both morning glory booms was Osaka. 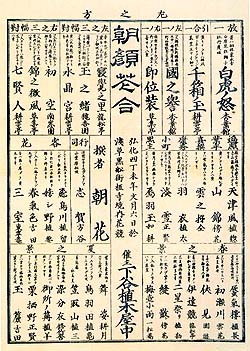 Osaka was first to publish several types of illustrated morning glory books during the Bunka-Bunsei boom. These in turn excited Edo horticulturally minded publishers to issue their own versions beginning with Asagao sō (1815) that was followed by similar examples. of henge or ‘mutant’ morning glories. A good example in the Lisa Sainsbury Library is the book with a simple title strip containing characters to phonetically spell ‘asagao’. 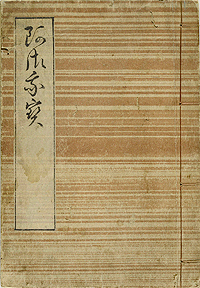 The book is in a traditional hanshi-bon size, which measures around 22 x 15.5 cm and is typical format of those made in the Edo period. Aside from the green woodblock printed border and cartouche, each page shows a particular type of morning glory drawn and painted by hand. Name of the illustrated morning glory is inscribed inside the cartouche, although some are presented without names. Curiously, except for the title of the book and names given to the blossoms, no other text appears in the book. 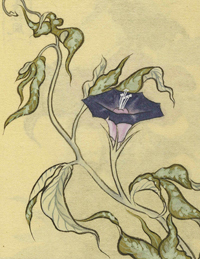 The book contains a good selection of eccentric and fantastic types of morning glories. 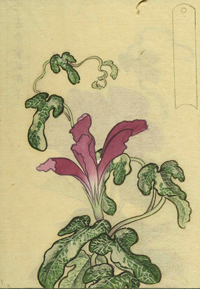 Compared to the aforementioned ‘Asagao sanjū rokka sen(36 morning glory selection)’, however, the flowers presented in Lisa Sainsbury Library’s ‘Asagao’ are much tamer and suggests that the book was made inspired by the fashion seen during the Bunka-Bunsei era. The desire to capture the ephemeral beauty of morning glory flowers can be explored through these brightly coloured images. While the trend to cultivate the plant is no longer a common practice in Japan today, the image of the glorious flower is firmly positioned in the Japanese cultural psyche as one that signifies the arrival of hot bright summer. Nitasaka, Eiji. Morning glory mutants induced by transposable elements in Edo era. Protein Nucleaic Acid and Enzyme, vol. 52, no. 15, pp. 1959-64.